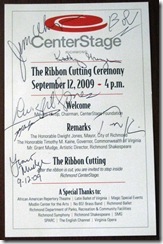 The inaugural meeting of the CenterStage Foundation (organized to raise money for this amazing project) was held on September 11th, 2001. 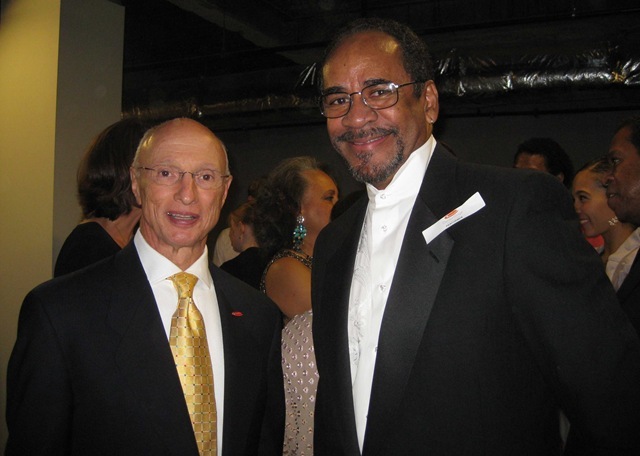 In an unplanned tribute to that meeting, a black-tie affair unofficially opening the Carpenter Theater to donors and dignitaries, was held on September 11, 2009. 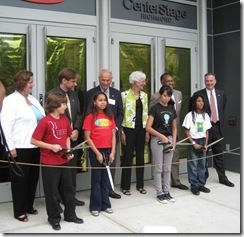 The official grand opening of Richmond CenterStage was yesterday, September 12th, 2009, and what an opening it was! 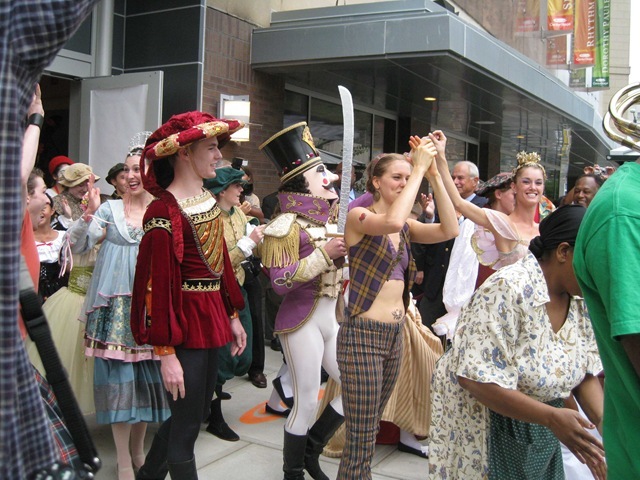 There was a ribbon-cutting ceremony in the afternoon, followed by a spectacular performance at night, including all nine resident performing groups. 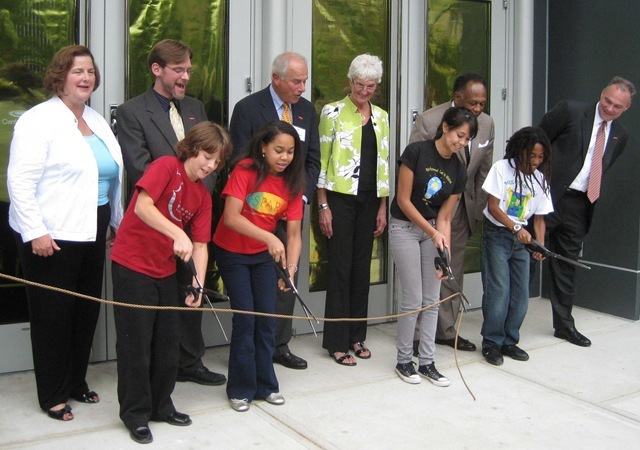 For an excellent article covering the opening, including a video of a few of the highlights of the ribbon-cutting ceremony, read the coverage in the Richmond Times-Dispatch. 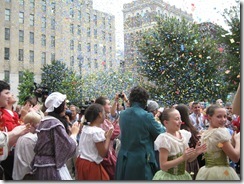 So, how did two life-long New Yorkers end up at both the ribbon-cutting ceremony and the grand opening performance? Simple, our closest friends are life-long Richmonders. 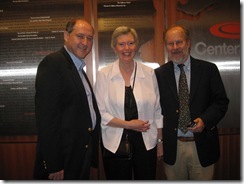 Bob Mooney is the Vice Chairman of the CenterStage Foundation. 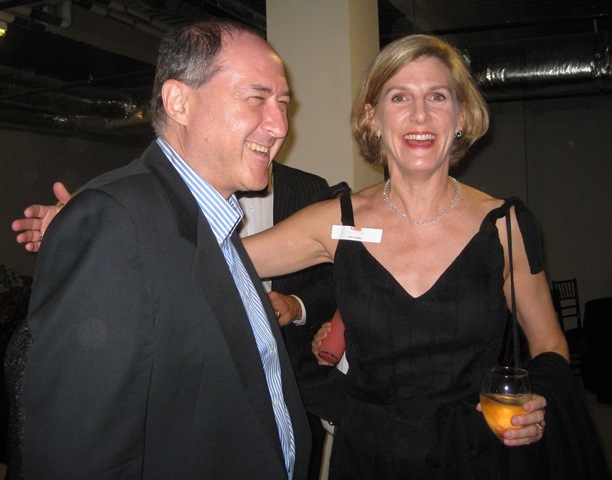 He was instrumental, along with hundreds of other civic and artistic minded Richmonders, in working tirelessly, for eight years, to see this project to fruition. There were five speakers at the podium before the actual ribbon cutting. 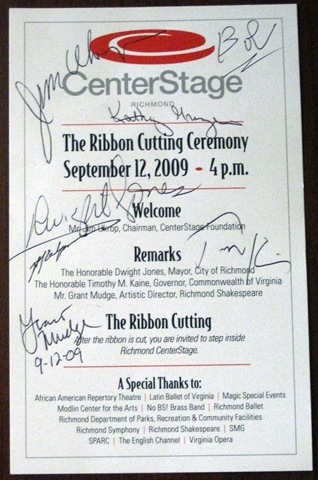 Jim Ukrop (Chairman of the CenterStage Foundation), Dwight Jones (Mayor of Richmond), Tim Kaine (Governor of Virginia), Kathy Graziano (City Council Representative in Richmond) and Grant Mudge (Artistic Director for Richmond Shakespeare). 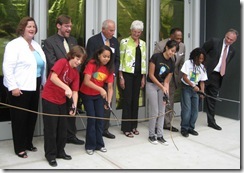 All were rightfully bursting with pride over the birth of this wonderful Performing Arts center. This was our first glimpse of the Mayor. Lois and I left extremely impressed with his presence and message. CenterStage is playing a small but important role in a sweeping revitalization of downtown Richmond, and we have faith that Mayor Jones is an excellent person to lead that transformation. Note: All photos in this post can be clicked on to see larger versions. 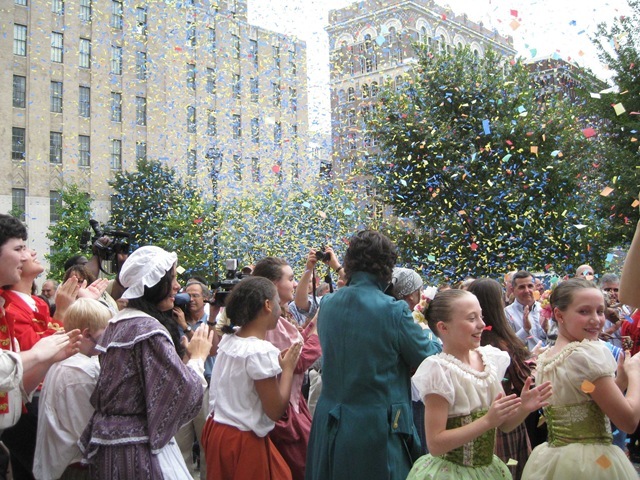 As the ribbon was cut, dozens (perhaps as many as 200?) 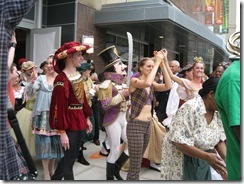 of the performers from the various resident companies burst through the doors, in what could only be described as a Mardi Gras style procession. The Jazz Band was incredible (leading the way), and all of the performers, in full regalia, mesmerized the crowd with their grace and infectuous smiles. After the ceremony, everyone was invited to explore the entire CenterStage complex, including the Carpenter Theater, Rhythm Hall and the Libby Gottwald Community Playhouse. We were blown away by everything we saw. What was more amazing than our own reactions were the spontaneous gasps, oohs and ahs that were involuntarily uttered by practically everyone that walked into any of the spaces (most notably the Carpenter Theater and the Donors Lounge). To top that off, there was such an incredible spirit of belonging (being a part of this magical place), that after finishing the gasps, strangers started talking to each other and gushing about the place. It was extraordinary! After grabbing a quick dinner at home, we returned to the Carpenter Theater for the grand opening show. 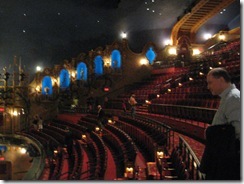 We arrived shortly after 7pm for an 8pm curtain. The place was buzzing with a ton of people there already. 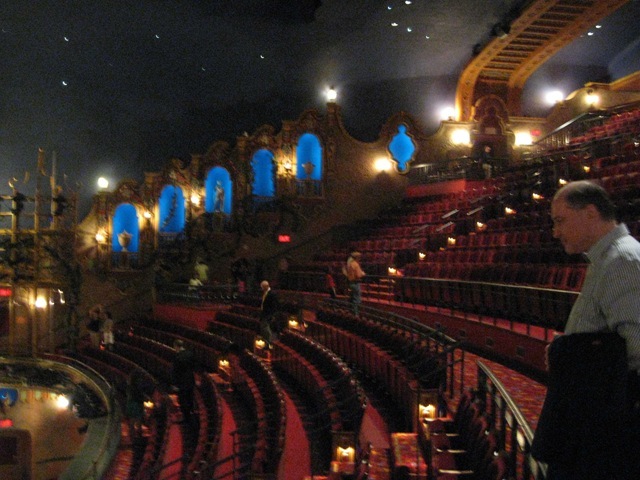 The Carpenter Theater seats 1,736 people, and it was sold out last night! That would be impressive any night, but was even more impressive considering that NASCAR was in Richmond on Saturday! A local hero won that race, so it was a big weekend all around for Richmond! While the show was spectacular in general, what made it magical (a word heard very often on both Friday and Saturday nights at the Carpenter) was the eclectic mix of genres performed, and the ability to sample a smorgasbord of art forms in one sitting. Sheer genius. Kudos to the people who envisioned it and executed their vision to perfection. Here’s a concrete example from me personally (I’m sure there were hundreds of analogous experiences, but perhaps with a different collection of likes and misconceptions). Prior to last night, it would have been difficult for someone to get me to attend the Ballet or the Opera. I had strong conceptions of what an evening at either would entail. 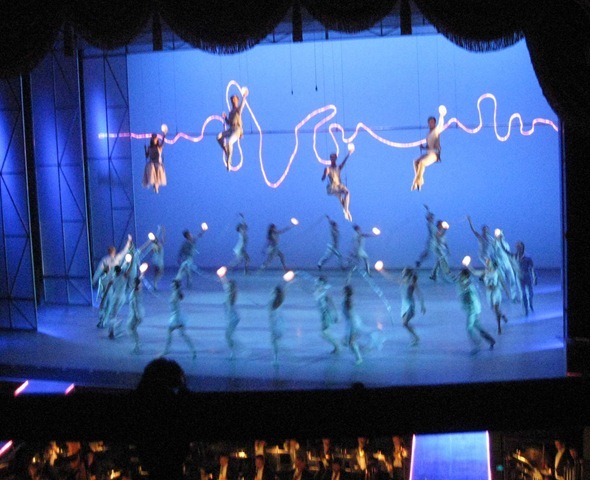 While the selection from La Boheme for the Opera piece didn’t change my mind on that, I was shocked at how much I was immersed in the Richmond Ballet performance (which was the finale of the evening). 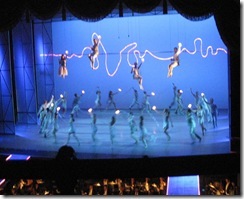 They performed Windows (Final Section), a ballet choreographed by the founding Artistic Director of the Richmond Ballet, Stoner Winslett (now in her 30th year in that position!). The Richmond Symphony (who were incredible all night long) accompanied the Ballet playing an original work commissioned for this piece. The music was exceptional, and it restored my faith that brilliant classical pieces continue to be created now, even though they are creatively different than the masters of a few centuries ago. I could fill a few more pages covering each of the performances in detail, but instead, I’ll conclude this portion by calling out one additional extraordinary musician, who also mesmerized me with his play. Amadou Kouyate played the 21-string Kora. He performed with the Elegba Folklore Society who presented an excerpt from Marketplace Suite. All of the dancers and percussionists in the Elegba performance were excellent. Still, I can’t help but highlight Amadou directly. His fingers seemed to be barely moving, yet the richness of sound that came out of the Kora was beautiful and mind-boggling. It was a long piece, and he kept up his level of play throughout. Amazing! Here’s a YouTube video of him singing (he did not sing last night). Aside from the fact that I like the song, it shows a number of people playing a Kora. In the video, most are sitting down. You also see someone playing the Kora while standing up, which is how Amadou played it last night. We then walked over to the after party. It was a wonderful scene, with most of the performers milling about (no longer dressed in costume) and quite a number of the patrons as well. The food (and drink) were exceptional, and we got to chat with a few people. For me, the highlight was speaking to Stoner Winslett about the ballet piece. Lois got her to sign our program. Cool! Then Lois chatted with the incredible hosts of the entire evening, Tim Reid and Daphne Maxwell Reid. 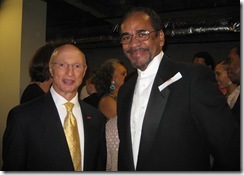 While both had well-known TV careers, they have continued their artistic careers, and have supported new ones, through their VA-based production company. 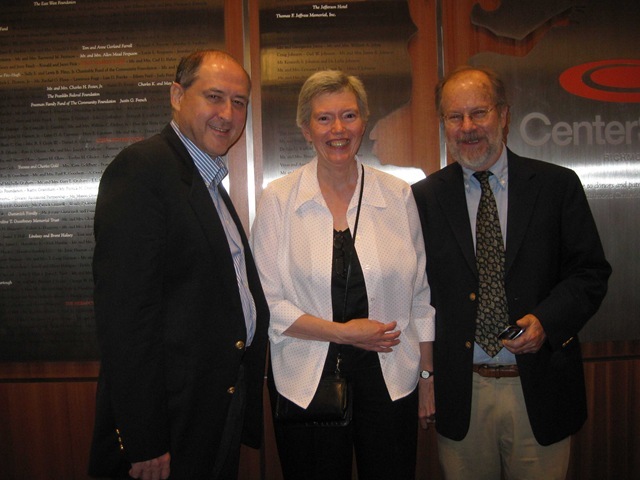 Both of them were charming and gracious and also both signed our program! Score!